(Daredevil/Spider-Man#4 (fb) - BTS) - After dying in battle with Daredevil, Copperhead found himself in Hell, where he was granted supernatural powers and eventually sent back to Earth in order to get innocent souls for his unidentified demon master. He planned to get his ultimate revenge on Daredevil in the process, putting together a plot that would use the Owl and Spider-Man as well. (Daredevil/Spider-Man#3 (fb)) - In restraints in jail, Stilt-Man was diagnosed with a Napoleon complex and involved in heavy therapy. He soon met fellow inmate Owl, who recruited Stilt-Man to be his right hand man and to serve at his side when they got out. The two of them soon met up with the new Gladiator, who'd been released on a day-pass to minimum security in order to monitor his delusional episodes. The trio, under the guise of group therapy, began spending a lot of time together and planning future conquests, deciding they'd call themselves the Gang of Three. They eventually broke out of prison and united with Copperhead, calling themselves the Gang of Four and deciding to go after the Kingpin's territory. (Daredevil/Spider-Man#1) - As Stilt-Man worked on his stilts in a fowl mood, he expressed his frustration at not going after the Kingpin directly, threatening Gladiator when he tried to console him. Owl approached, admiring each of them for their potential for success and riches. That night, they attacked the Kingpin's building. Copperhead killed a security agent, leaving a coin on his head, whole Stilt-Man and Gladiator made their way to the penthouse, taking out any guards they passed. The Owl then, from his helicopter, fired missiles at the penthouse, hoping to kill the Kingpin and his men. (Daredevil/Spider-Man#3) - As Daredevil lay unconscious, Stilt-Man held Spider-Man, who sorrowfully claimed that Daredevil was his brother and dead, at gunpoint and explained how they'd formed as a gang. 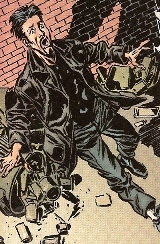 Daredevil threw sludge in Stilt-Man's face, causing the villain to fire his gun accidentally and collapse the ceiling around them, creating a hole to the street above. Gladiator leapt at Spider-Man, who evaded him, then Gladiator was hit by Daredevil. Stilt-Man fired on the heroes, who dodged and escaped to the street above. The Gang of Four pursued them and Spider-Man knocked down Gladiator while Daredevil kicked down Copperhead. They were then surrounded by the Kingpin and a group of armed men. 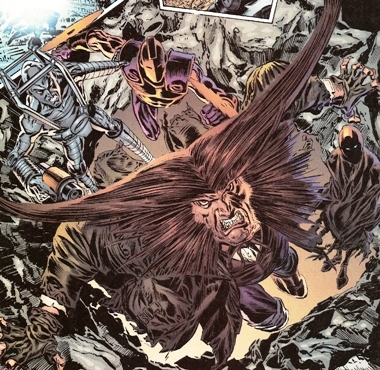 Owl, whose speech was interrupted by frequent nikt sounds, leapt in a fury at Kingpin, but the men opened fire on him as he attacked. A massive battle followed, during which Stilt-Man punched Spider-Man and Daredevil tossed a gunman into Gladiator. When the cops arrived, Owl attacked Spider-Man and Stilt-Man exploded the cop cars with his guns. Daredevil approached Copperhead, asking who had brought him back and how he was alive, so Copperhead pulled off his mask to show that he wasn't alive at all. (Daredevil/Spider-Man#4) - Copperhead invoked the name of his demonic master and trapped a three block section of New York under a mystic force field, calling it New Perdition. 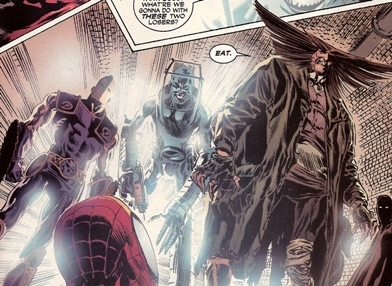 Copperhead unleashed zombies on Daredevil and Spider-Man, then took Stilt-Man and Gladiator to the Clinton Mission Shelter, where he suspended them upside down and made them face visions of being eternally judged. Spider-Man rushed to free the villains, and was caught up in a similar vision himself. Daredevil held a gun to his head, willing to end his own life rather than let Copperhead make others suffer, but the Owl stopped him. Facing up to his own evil, Owl seemingly sacrificed his own soul to save Daredevil's. He knocked Copperhead through a portal back to hell and was taken with him. Stilt-Man and Gladiator fell to the floor and were presumably later arrested. Comments: Created by Paul Jenkins, Phil Winslade, and Tom Palmer. Owl has since shown up again in several stories, so maybe Copperhead is back on Earth too. (Daredevil/Spider-Man#1 (fb) - BTS) - A small-time criminal who'd fought against Spider-Man (Peter Parker) and Daredevil (Matt Murdock) occasionally, Kenny Fitzgerald always claimed innocence of any wrong-doing. He thought things over when Jack Abbott tried recruiting him for a new crime cartel. (Daredevil/Spider-Man#1) - Kenny was frightened with Spider-Man chased him down an alley and blocked his run with a web. Kenny claimed that he was only involved in relaying information lately and that he had turned down any criminal offers. Trying to shake information out of him, Spider-Man hung Kenny upside down in a web and Kenny, scared of heights, revealed what he knew about Abbott. (Daredevil/Spider-Man#1 (fb) - BTS) - Jack Daniel Abbott, a small time criminal who spent his years in and out of jail, developed a professional working relationship with Matt Murdock. Abbott was recruited by the Gang of Four, which was run by the Owl (Leland Owsley) and ordered to recruit small-time hoods. Abbott recruited several, including Kenny Fitzgerald, before being arrested again. (Daredevil/Spider-Man#1) - Murdock visited Abbott in jail seeking information on Abbott's recent dealings. Abbott didn't dare reveal his employers, but he did send Murdock a secret message of 7-M-O, which he hoped Murdock would realize was Owl spelled backwards.